Only types K and L copper may be used because they have an adequate wall thickness. Type M and DWV are not permitted. The branch formed must be at least one pipe size smaller in diameter. Special tools designed for extracting tees must be used (Tee Extractor Set). The end of the pipe forming the new branch must be prevented from penetrating into the flow of the existing pipe. The new joint has to be brazed or silver soldered. Soft solder is not permitted. 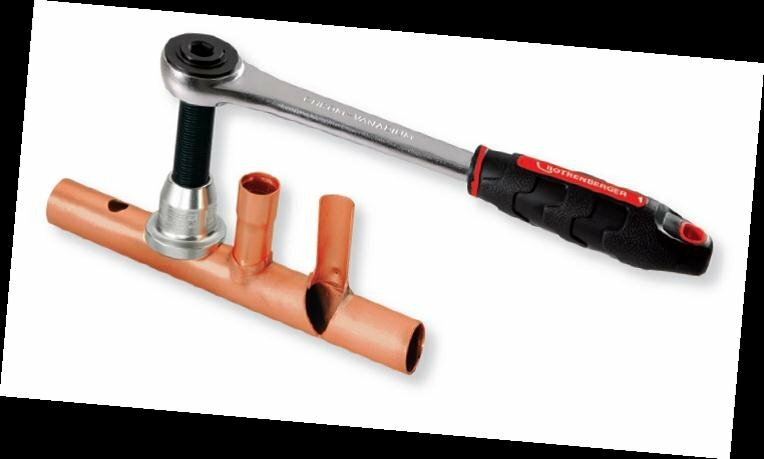 Extracting a tee was common place in the past when labor was often cheaper than purchasing expensive manufactured copper tee fittings. In those days, pulling a tee involved cutting a small hole, repeatedly heating the pipe to anneal the copper and slowly forming the tee with a couple of simple hand tools. An older friend and I worked with and demonstrated the process, seen below. Thanks Marc! T-Drill makes a handy tool set that really speeds up the process. It uses a special drill bit that pierces the pipe, and pulls the cup out into the exact diameter needed for a similar size pipe. It also comes with a tool to form the branch end, and dimple the pipe to prevent it from penetrating too far into the pipe.